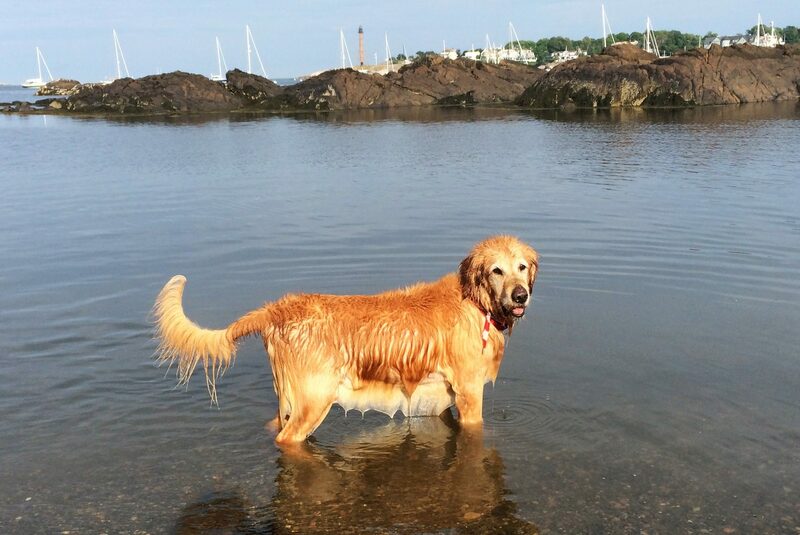 Our store, Original Beach Dog, was born out of pure love for our 13 year old Golden Retriever, Fenway, (and our beloved Golden Retriever, Lennon) and our desire to share the absolute joy and happiness that he and we got from a day at the beach together. Fenway remained ageless whether he was swimming, diving for rocks, rolling in the sand or digging enormous (and I mean enormous) holes in the sand that he would then lay in and rest before getting up and doing it all over again. Jim’s original designs are all based off of Fenway’s image. Jim would often pose Fenway in different positions to capture just the right angle for his designs. Fenway was a wonderfully willing subject especially when treats were involved! With Jim in charge of designing and the creative side of things, his partner in life and business, Nancy DePasquale, handles the day-to-day operations of Original Beach Dog. Nancy loves meeting and greeting visitors to our store and she thoroughly enjoys hearing all about their travels especially about their love affair with Rockport. So many folks she has chatted with come back year after year and now we can look forward to being a part of their tradition. Opening day for Original Beach Dog was Mother’s Day, May 13, 2018. Fenway was an enormous hit in the store getting endless attention, pats and kisses. He would often lie right in front of the open doorway to make sure he caught all of the action passing by on Bearskin Neck. People walking by the store couldn’t resist stopping to take pictures of Fenway and customers even posed with him while wearing the shirt or hat they just purchased. Little kids were so drawn to the fluffy, Golden Retriever sleeping in the doorway. It was priceless; life was great! Unexpectedly and heartbreakingly, Fenway passed over the rainbow bridge on June 7, 2018, less than a month after our opening. Needless to say our hearts are broken and we miss his sweet presence every day. The only savior is that Fenway surrounds us each and every day at Original Beach Dog. His legacy lives on through our beautiful store, through all of the amazing images that Jim has created and through sharing this heartbreaking but inspiring story with all of the wonderful people who have passed through our doors these last several months. It has truly helped us through an extremely sad time and our heartfelt thanks go out to everyone who has visited the store and who have allowed us to tell our story and who in turn have shared their own stories with us. Many tears have been shed and bonds made, kind and caring folks we will never forget. The show must go on as they say and Jim will be adding new designs to the line each season. We look forward to seeing your smiling faces as you peak through the windows of our little slice of paradise on Bearskin Neck.